Summer seems to be my season for modelling structures – and this summer, I’m tackling the most important customer on my model railway: the Leedham’s Mill, literally at the end of the line in Port Rowan. This is a visually interesting structure with an equally interesting history. The mill office started life as the railway’s freight house. It sat east of the station, and was painted in Grand Trunk’s two-tone scheme. But the railway sold the structure to Leedham’s Mill, and in February of 1938 the mill hauled the freight house across the tracks and west to the mill property. The mill’s new office was put on a new foundation and at some point, a cinder block extension was added. Also at some point – I’m not sure when – it received a coat of red paint. This structure still exists as part of Doerksen Farm Supplies Ltd.
Late last year, I was fortunate to sit down with Donald Archie Leedham, who worked in the family mill in the 1940s and 1950s. Donald provided me with a lot of useful information about the mill and its relationship with the railway, which you can read about in an earlier post. Just click on the photo, above. My mock-up of the office has done terrific service on the layout, but has been in place for several years now while I focussed on other projects. Given that it’s right up front on the layout, and one of the first structures visitors will see, I wanted to polish my skills on structures that are not such a signature item. But last weekend, I printed out a package of detail shots – many taken for me by Mike Livingston on one of his trips to Port Rowan. I made several notes on dimensions and claddings, and then got to work cutting and gluing styrene and strip wood. For this structure, I’m using the wall farthest from the aisle as a place to experiment with stains and shading. I’ve been doing a lot of painting lately for tabletop miniature gaming and role playing games, and learning painting techniques that are new to me, so I’m working on applying them in a model railway context. To emphasize the walls, I’ve stained individual boards and battens with browns and greys, then randomly glued them to my styrene sub-walls before blending everything together with a top coat. I’m really happy with the results so far, and look forward to continuing to experiment with washes and tones. This entry was posted in Port Rowan - Leedham's Mill, structures by Trevor. Bookmark the permalink. Looking really nice Trevor! And looking forward to following your build! You were very lucky to have Donald’s help with this research project, and the history of the company was a very interesting read. It will be another excellent addition to the layout with a fantastic backstory. I am very impressed with your work. 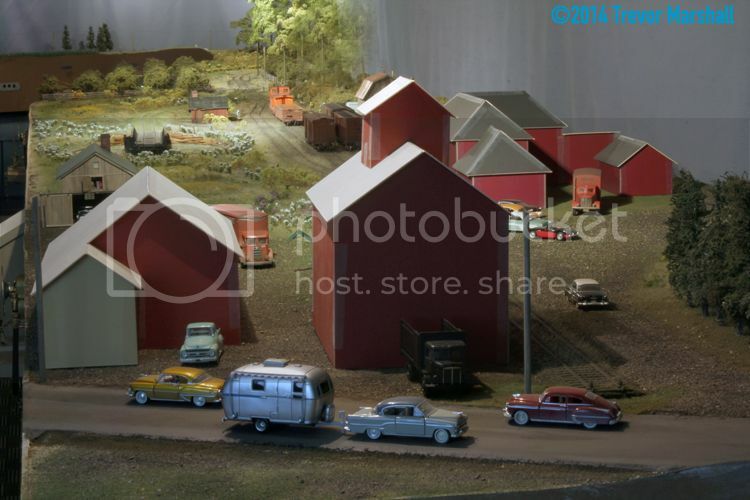 I lived beside the CNR yards in Merritton Ont as a boy for 14 years and your models are very detailed and accurate. Great work. I spent a fair bit of my youth at the yards riding cab up to Thorold or St, Catherines on double and triple headers. It’s something you never forget. Enjoyed reading your research. I would like Scott’s contact info please as I would like to visit Don too for some Forestville history. “…I’m already feeling a little bored and battered by board-by-board board-and-batten…” – good one, Trevor! Looks great, Trevor. Are you using a stain for the red or a paint? Good to see some structure work on Port Rowan, it’s been a while isn’t it? I do agree with you, applying techniques learned from other modelling activities are a good way to have a wider choice of approaches to a given task. One things I learned with war gaming figures and larger garage kits (from 1/8 to 1/4) was to litterally emphasize lighting and shadows artificially. It’s sad model railroading weathering, structures and scenery rarely venture there while it yields terrific effects. Your boards and battens speaks by themselves. Did Leedham exterior woodwork weathered a lot over the years? I’ve often found on similar building the wood grain gets quite coarse over the year.